Deal of the Day – Calm Colour Create Magazine is just $12.74 for 1 Year at Best Deal Magazines, March 28th Only – A Retail Value of $59.94 – with Coupon Code 150401. 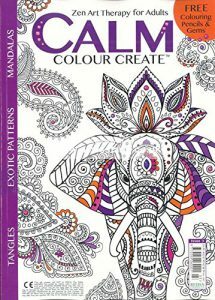 Calm Colour Create – an adult coloring book and the latest craze in publishing, has 64 pages of intricate coloring spreads, designed to help focus the mind and aid relaxation. Each issue is filled with sophisticated designs, bespoke patterns, mandalas and tangles based on a theme. Also included is a feature section offering tips and techniques, craft project ideas using the completed drawings as well as a gallery showcasing the colorists finished masterpieces. The pages are perforated for easy removal. Calm Color Create offers a form of escapism, where one can shed the stress of daily life. Published bi-monthly. Where can we get the subscription for this price? We just bought our first book from Calm Color Create. The Flora and Fauna book. All 22 pages and can’t wait to get started. Best Deal Magazines offers super low rates, but it’s always a one-day price. I don’t see it currently available at any price on their site, nor on DiscountMags. Amazon has it for $30. ouch!